THE PICKIEST EATER IN THE WORLD: SEVEN YEARS OF HAPPINESS.. I hope you don't mind if I take a break from my food posts to share with you a quick trip back down memory lane.. I consider you all family now, so I'm more than happy to share with you, the story of how Rina and I got married. It all began with a Proposal..
Rina And I had been together for two years already, and I had no doubt in my mind that this was the woman I wanted to marry. But my problem was that, I couldn't propose to her just yet because I didn't have enough money saved up to give her the grand wedding that she had always wanted. She opted not to have a lavish "debut", so she was determined to make sure her wedding was one to remember. One day, while I was at work, she texted me and said, "You know, I was thinking about it, and I don't need a big wedding. I just want to be your wife. It would make me the happiest woman on Earth." This was a woman that had dreamed of a fairy tale wedding ever since she was a teenager.. So for her to give that dream up meant a lot. 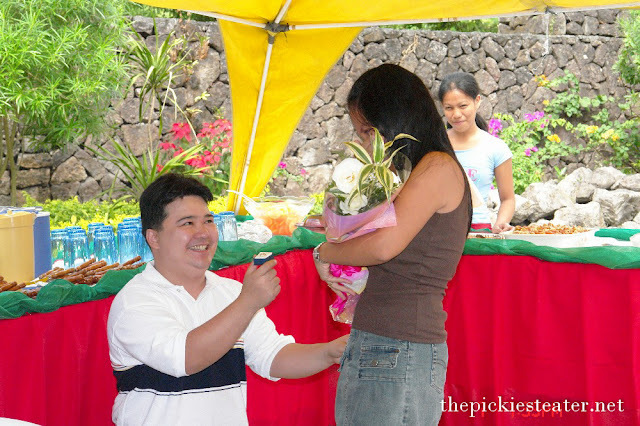 I knew that If I couldn't afford to give her the wedding she deserved, the least I could do was give her a proposal to remember. So that was it, we had very business like, "decided" we were going to get married, and reveal our plans to our family during my birthday party. But what she didn't know, was I had a diamond ring in my pocket during the "Announcement". Please forgive the quality of the video. You must understand, this was 2008, Facebook was fairly new, and didn't play HD videos yet. Good thing I have pictures! Rina said the look on my face made her think I was actually playing a joke on her hehe..
Quite a few things happened leading up to the wedding that I don't want to get in to, but long story short, we decided on a "Hollywood" theme for our wedding. 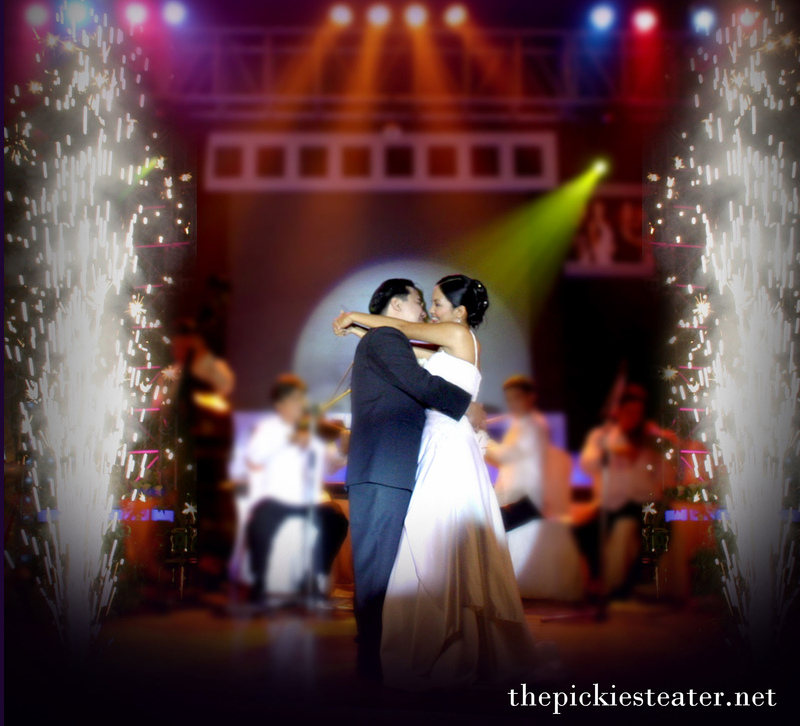 We would treat our wedding as if it were an event "movie", with the ceremony the "Premiere Night", and the reception the "After Party". In keeping up with the Hollywood theme, the invitation came with a DVD Trailer of the "movie", which we entitled, "Some Kind of Wonderful". As you can see, we had lots of fun making the video, and again, I gotta thank Cody,Blue, Ryan, Ronnie, Giant Joel and Ted for all their help in making this video possible. The DVD came in this as the cover..
And a few of my suggestions were not..
Rina and My mom are such Kill Joys! Something I failed to mention was, there was no way my mom wasn't going to make my wedding one for the ages. She knew how long Rina had dreamed of this day, and was aware that Rina said she was willing to give that all up.... Well.. let's just say.. Rina's dream of a Fairy tale wedding came true. The ceremony was held in a small, but beautiful chapel near my parents home in the woodlands of Antipolo.. To me it was absolutely perfect. Not to belittle the amazing efforts of Rina and my mom, but I honestly didn't need all the fanfare. I could have married Rina in a sewer and still have been the stinkiest happiest man in the world. But like I said, my mom made sure that Rina got the wedding she deserved. 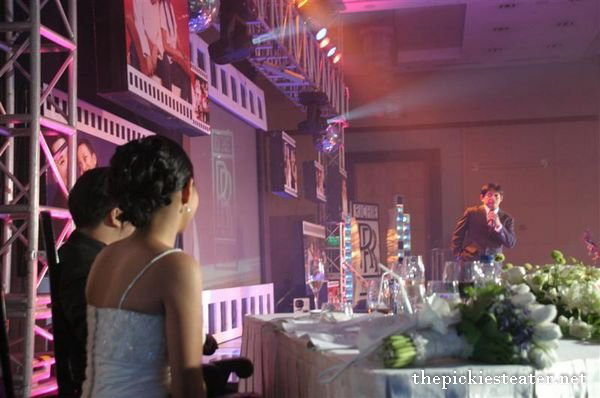 Our wedding reception was held at Crowne Plaza in Ortigas, and my friend and brilliant singer Richard Villanueva hosted. My friend Will Devaughn was able to drop by for a few minutes with fellow PBB Housemate and eventual winner, Ruben. I said I wouldn't dance. but Rina would really have gotten pissed. who sang her a song that he had wrote a very long time ago. It really was a magical night for us.. Surreal, in fact. It was the perfect way for Rina and I to start our lives together. But of course, you all know her more as "Baby Rain". Just the other day, Rina apologized to me because she said she wasn't able to get me a gift yet for my Birthday.. I told her this.. "You gave birth to our beautiful, healthy baby girl. That's the best gift anyone could have ever given me. You don't owe me another gift for the rest of our lives." 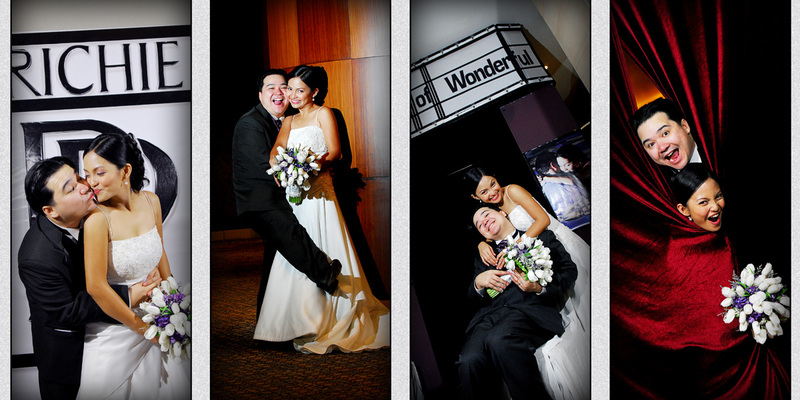 To my soul mate, and partner in everything I do, Happy Anniversary, my dearest Rina! 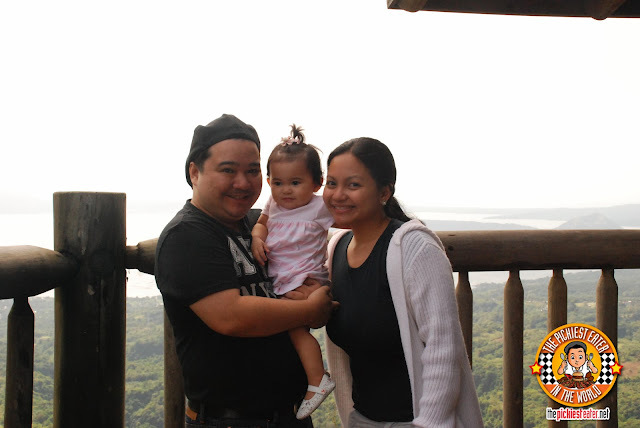 Thank you for taking care of Baby Rain and I... We love you! Hope you guys don't mind the cheese.. I hate you Richie!!! You had me crying and laughing and oooing and aaahing (and crying even more!) all by myself at 3:30am!!! Such a wonderful proposal... it was all about Rina.... you had me crying buckets along with your guests at your birthday. 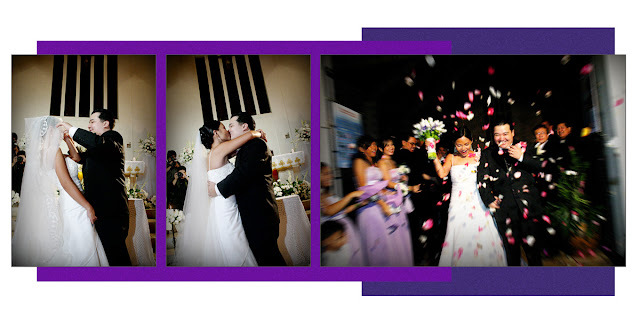 And your wedding invitation dvd is so brilliant! And of course your wedding video is so touching! Happy anniversary you two! More power and God bless! kakapanood ko lng ng tatlong wedding videos at eto un pang-apat..
lalo lumala un "colds" ko.. Happy Anniversary Daddy and Mommy PE! Well, anyway, Godbless and stay happy and sweet to each other! Like Rina, I didn't have a grand debut. I'm saving it all for my wedding. But this just inspired me to give it up now since we also have our little princess. May God continue to bless not just your relationship but also your family. I read this from top to bottom, and watched the videos even though I know na they'll make me cry. :)) So sweet!!!!! Thanks for sharing your story with us. Tumataas tuloy lalo ang standards ng mga babae because of stories like this. Hahahaha. Okay, I got teary-eyed. I love this post. I laughed rin, especially with your unapproved picture. Hahahahah! Haha maganda naman yung picture namin, dba?? This is a lovely, lovely post! It's an all sorts of cheezeee!! Haha! And I just found out that Rain's name is Renee' Amelie, I love the name Amelie! haha much thanks, oh Sharky one! wow! and awww :( you are really romantic sir rich, you're story really make me feel like I am reading a fairy tale book, Congrats !! T'was just now that I've read this and watched the videos..It was really so sweet! Great, great love story - and i love the witty remarks, haha! Aww.. This is such a beautiful post sir Rich! 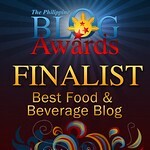 Thanks for sharing this with us :) I got a bit teary-eyed on how heartfelt you've written this. The videos and photos got me giggling though :D Halong kilig at tuwa! Anyway, happy 5th anniversary to you! I wish your love to overcome all the adversaries in the world. Continue being the awesome couple, parents and children that you are. What a very heart-filled post. 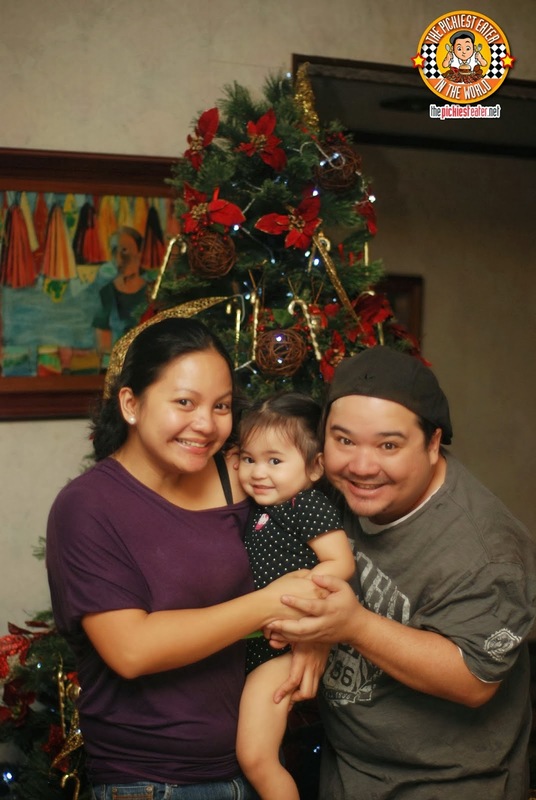 I got teary-eyed and joyful for the you two and Baby rain. =) You are one of the most sweetest, fun-loving and inspiring family I have ever known. Cheers to more years to come! O.M.G. I Looove the cheese!! <3 Please, bring it on! :) You're such a romantic Richie, naiyak naman ako. What a great fairy tale. Sana every month may cheesy story ka, super kilig haha! Happy anniversary to you & Rina. You truly are soulmates & belong to each other. Overtime na for a baby Rino! ;)) Love the Zamora family! Always a great story every time I hear it. :D All the best to your family, bro! Here's to more adventures :D !